Por Ernesto Cabral y Óscar Castilla C.
Top clients of the two most important banks in Peru—Banco de Credito del Peru and BBVA Continental—managed offshore companies in tax havens thanks to letters of presentation and recommendation issued by those financial institutions. The front companies were administered by Mossack Fonseca, a law firm under investigation by the Prosecutor’s Office and US authorities for alleged money laundering. Banco de Credito del Peru (BCP) and BBVA Continental (BBVA)—the two largest financial groups in Peru—issued letters of introduction and recommendation to a group of top clients seeking to create offshore companies in the tax havens of Panama, Nevada (USA), and the British Virgin Islands (United Kingdom) through the law firm Mossack Fonseca, which today is being investigated by the Peruvian and US judicial systems. 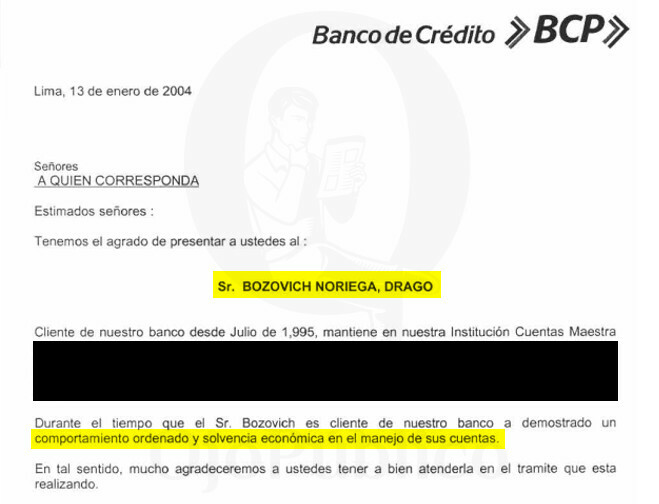 As part of the Dineroleaks (Moneyleaks) investigation about the role of banks in the penetration of suspicious flows of money, and after reviewing the files of the Panama Papers Case, Ojo-Publico.com has found that letters of introduction and recommendation from BCP and BBVA were sent directly to clients linked to the Panamanian law firm, as well as to others implicated in money laundered from illegal gold mining and logging in the Peruvian Amazon. FINANCIAL SYSTEM. Fines and investigations against HSBC or Deutsche Bank are part of a global initiative to identify the role of banks in the laundering of illegal money. Dineroleaks is part of a global initiative to identify the role of banks in the laundering of illegal money. Over recent years, the US has fined HSBC for its links with the Mexican cartels, Costa Rica has punished Scotiabank for failing to report bribes paid by Odebrecht to former president Alejandro Toledo, Germany has intervened in Deutsche Bank over the Panama Papers, and European authorities have investigated the Banca Privada d'Andorra and the Meinl Bank of Antigua and Barbuda for the Lava Jato case. 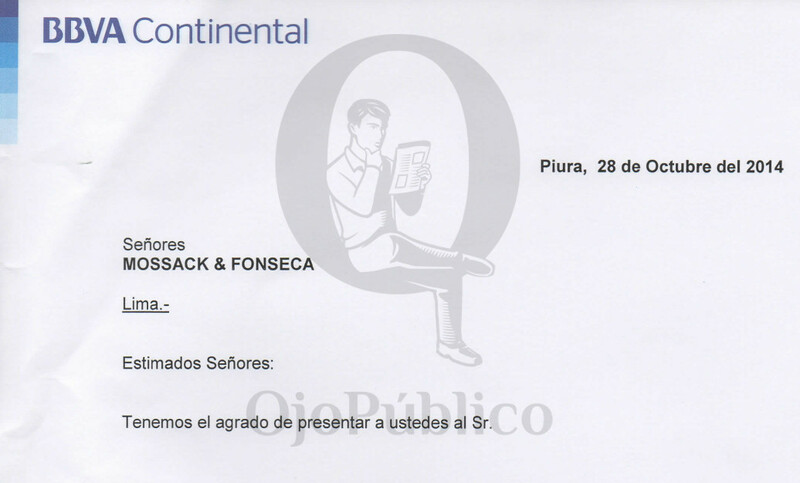 The journalistic investigation has established that the letters from BCP and BBVA were included in the digital files of Mossack Fonseca clients, whose office in Lima has been under investigation since 2017 for organized crime and money laundering. These clients were included on the basis of their financial resources, from the Premium (individuals with balances in excess of US$200 thousand) and Exclusive or VIP categories (monthly income of US$1,700). INVESTIGATION. 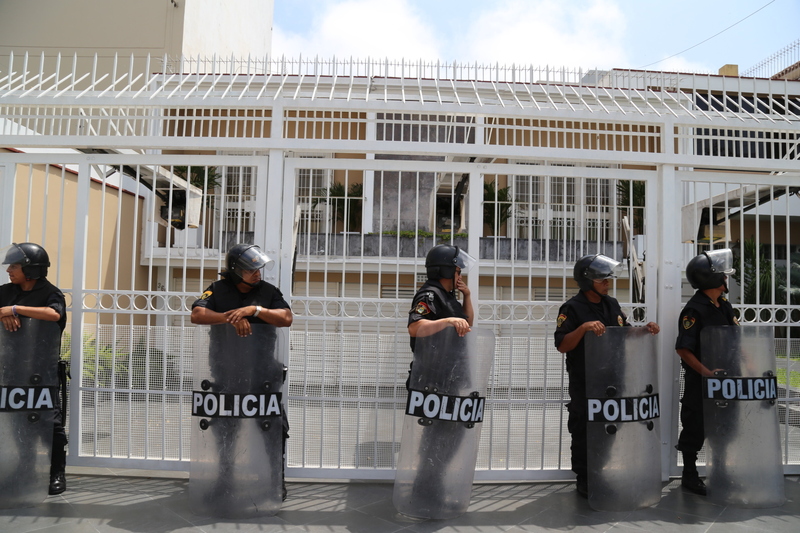 Mossack Fonseca's office in Lima, Peru has been under investigation since 2017 for organized crime and money laundering. Photograph: Audrey Córdova / Ojo-Publico.com. The investigation has also shown that the responsibility for preparing and issuing the letters resided with four divisions across the two banks: BCP Enalta, Exclusive Banking (BEX), BBVA Premium Banking, and VIP Wellness. Under the chairmanship of Dionisio Romero Paoletti (BDP) and Alex Fort Brescia (BBVA), both economists, each bank has established a division to implement a money laundering prevention plan in Peru. By the close of this edition, Ojo-Publico.com had identified twenty-two letters issued by the Premium and exclusive divisions of BCP and BBVA that were included in the digital files of around twenty offshore companies managed in tax havens by Mossack Fonseca. The list of clients includes important people under investigation by the Public Prosecutor for various illegal activities, and high-level executives and entrepreneurs with no known criminal records (including a former director of the Lima Stock Exchange and the current Director of the state-owned company PeruPetro). A list of clients has been created based on the official BCP and BBVA letters. The list includes individuals investigated by the Public Prosecutor's Office for links to the Panamanian firm or for alleged criminal activities over recent years. It includes Alfredo Chamy Allel and Jorge Zavaleta Vargas, accused of laundering money from illegal mining; Drago Bozovich Noriega and Boris Bozovich Balarín, accused for exporting timber of suspicious origin; and Luis Gasco Bravo, a rice entrepreneur from northern Peru and treasurer of Alan García's presidential campaign in 2006. The letters on behalf of Bozovich Noriega and Bozovich Balarín found in the archives of the Panama firm were issued by BCP’s BEX division in 2004. The bank states that the businessmen demonstrated “orderly behavior and financial solvency in the management of their accounts.” The Panama Papers case revealed that the Bozovich group, one of the most important timber conglomerates in Peru, managed at least ten offshore companies jointly with the Panamanian law firm in Panama, Nevada (USA), the Seycelles, and the British Virgin Islands. LOGGING. The letters on behalf of Drago and Boris Bozovich found in the archives of the Panama firm were issued by BCP’s BEX division in 2004. BEX also issued a letter of recommendation in February 2013 on behalf of the Chilean businessman Chamy Allel, a client of the bank since 1997, and later (2014) linked by Peruvian authorities to a seizure of 17 kilos of suspicious gold from the export company Axbridge Gold Corp. Ojo-Publico.com found the BCP letter in the files of Axbridge International Corp—the miner’s parent company created by Mossack Fonseca in the British Virgin Islands. By 2015, Chamy Allel, her children, and others linked to his case were all facing serious allegations of money laundering. So too were the Darsahn International and Titanium Gold companies, their intermediaries, and other suppliers of minerals, as a result of the 2014 seizure by Customs of suspicious gold from Oxford Gold (98 kilograms) and Axbridge Gold Corp (17 kilograms). The metal cargo—extracted and stockpiled in Cusco, Puno, and along the southern coast of the country—was to have been sent to the Kaloti refinery in the US. GOLD. 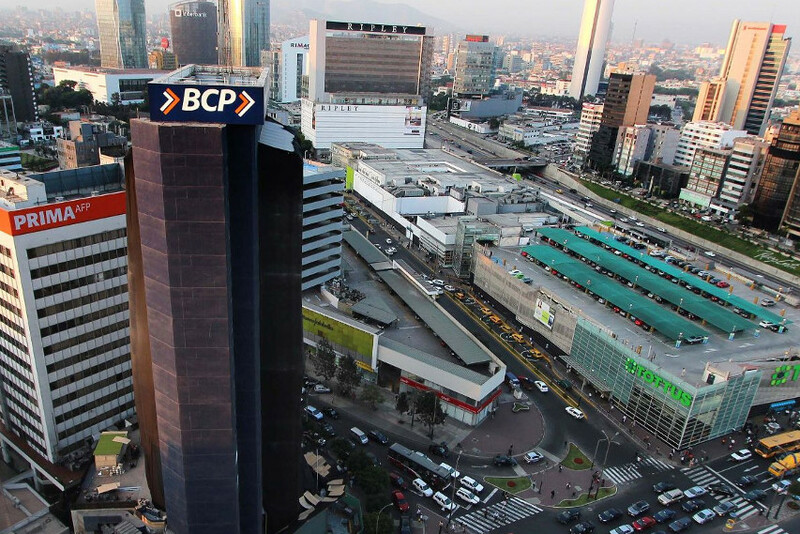 BCP’s BEX division issued a letter of recommendation on behalf of Chamy Allel, a Chilean businessman linked by Peruvian authorities to a seizure of suspicious gold. VIP Wellness issued a document in 2013 on behalf of Zavaleta Vargas, who was the following year sentenced to four years in prison for tax fraud related to the Peruvian gold trade. The letter of recommendation on BBVA letterhead requested by Zavaleta Vargas was placed on the digital file of the offshore Eagle-View Financial Services LTD, a company which Mossack Fonseca was at the time managing in the British Virgin Islands. For many years Zavaleta Vargas had been a shareholder of a Peruvian company called Universal Metal Trading, which exported gold to Switzerland by the ton. In 2012, the El Comercio newspaper revealed that the company was one of the largest mineral collectors from Madre de Dios—a region devastated by illegal gold extraction—and that its suppliers included local marketers who purchased gold from sources thought to be suspicious. The Panama Papers also show that Gasco Bravo—the aforementioned major player in the APRA’s finances during the 2006 presidential campaign and linked through Mossack Fonseca to three offshore companies in the British Virgin Islands—was a client of BCP’s BEX division and BBVA’s VIP Wellness division. Each bank had issued a letter of recommendation in June 2014 on behalf of the rice entrepreneur. These were also addressed to the US embassy, as part of the process to apply for a travel visa. The Panama Papers files reveal that Enalta issued letters of recommendation on December 12, 2012 and January 18, 2013 on behalf of the Australian Steven Chad Petrovich, head of the AK Drilling business consortium, linked at least to four offshore companies in Panama, and accused of making an unusual transaction of US$700 thousand as part of an alleged scheme of front companies. 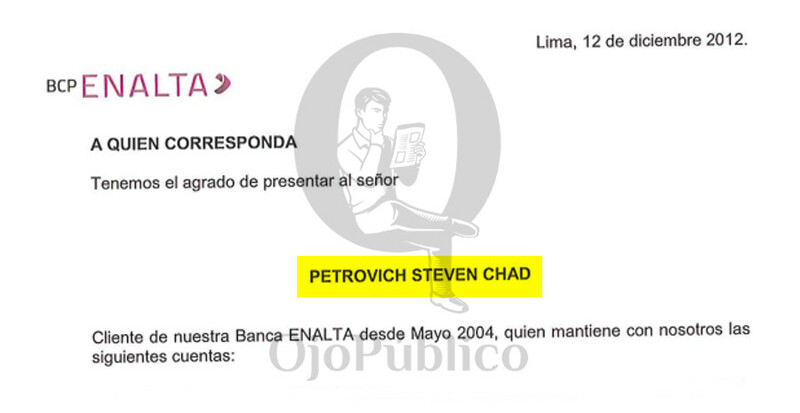 The letters state that Chad Petrovich had been a client of Enalta since May 2004. Enalta officials also issued a letter of recommendation in June 2015 on behalf of the Brazilian Tharcizio Calderaro Pinto, the former representative of Camargo y Correo in Latin America, a construction company now under investigation together with Odebrecht for the Lava Jato case. The Mossack Fonseca files also contain letters from the banks on behalf of Peruvian and foreign businessmen who have never been under criminal investigation and are classified in the national financial system as Premium or Exclusive clients. Today we publish the letters of recommendation issued and signed by Enalta, a department within ​​BCP’s Wealth Management Division, managed since 2013 by the economist Viviana Chiappe. The letters, printed on bank letterhead, date from December 2012 to November 2015. “We launch Enalta as a service for clients who have assets which, due to their amount and growth trend (income greater than PEN 20 thousand per month, approximately US$6,700), or with liabilities greater than PEN 200 thousand), require specialized investment and financing advice,” says the 2012 BCP Annual Report, a reference to the entity which issued the letters of recommendation for clients who later acquired offshore companies in jurisdictions considered to be tax havens. HIGH-LEVEL. Enalta, a department within ​​BCP’s Wealth Management Division, issued letters of recommendation to a group of top clients seeking to create offshore companies. Enalta officials also issued letters for José Balta Chirinos, current director of the state-owned PeruPetro; Daniel Said Montiel, former director of the Lima Stock Exchange (BVL); Nicolás Saverys Sebastiaan, manager of the Cincinnati real estate company and a BCP client since 2008; and Pier Giacchetti Pérez, general manager of the construction company Tecnología Materiales del Perú and holder of accounts at BCP since 1994. The same pattern is found with BBVA: the files of Mossack Fonseca hold a letter signed in July 2014 by BBVA Premium Banking officials on behalf of the Peruvian businessman Juan Bustamante Olivares, general manager of the insurance company Consejeros and a “client who shows very good moral and financial solvency.” The bank defines this division—headed between 2012 and 2018 by the engineer Gonzalo Cortés Novoa—as a “superior specialized service” that provides exclusive benefits such as tickets to Spanish La Liga football matches and advisory services from the prestigious auditor Ernst & Young. MOSSACK FONSECA. 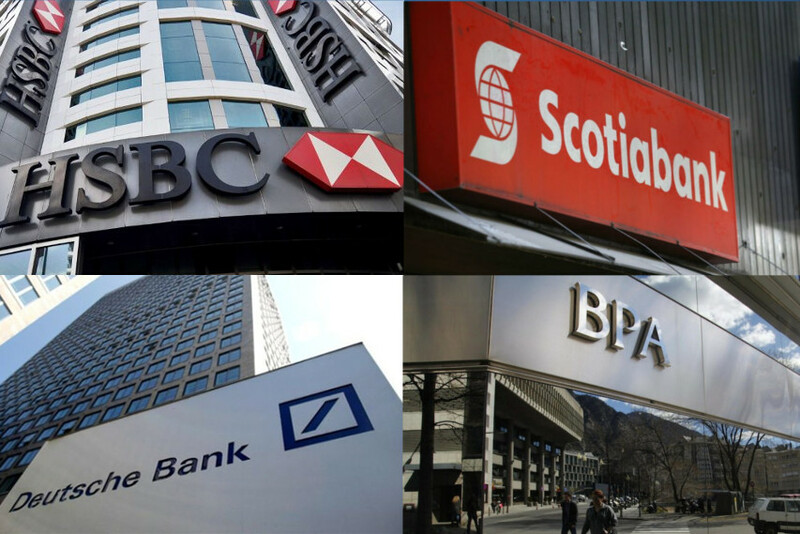 Top clients of BCP and BBVA managed offshore companies in tax havens thanks to letters of recommendation issued by those financial institutions. BBVA’s Wellness division also issued letters of presentation in April 2013 for Yaacov Gomberoff Elon and José De Aubeyzon Gargurevich, managers of the luxury jeweler G&G and clients of the bank between 2000 and 2006. The Mossack Fonseca files reveal that Gomberoff—who brought the actor John Travolta to Lima for the opening of this Lima jewelry store—and De Aubeyzon are linked to the offshore company B&H Assets Limited, incorporated in the British Virgin Islands. “If a person has money but does not know what to do with it, we advise how to invest it in the best way,” said Cortés Novoa in reference to BBVA Premium Banking during an interview. In 2017, this division organized a private meeting between his clients; representatives of the National Superintendency of Customs and Tax Administration (SUNAT), and; Claudia Cooper, the then vice minister for economy and finance, to inform them about the tax amnesty process that aimed to repatriate assets held overseas at the time. DINEROLEAKS. Secret documents revealed that more than US$2.200 million from drug traffic, illegal mining, tax evasion and corruption circled around Peruvian banking system. 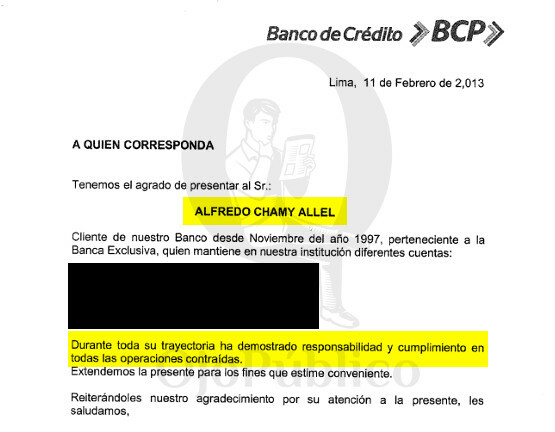 Ojo-Publico.com sought statements from BCP, BBVA, and their clients. The only response we received came from José Balta Chirinos, senior manager at PeruPetro and client of BCP’s Enalta. He stated that the offshore company Uso de Mare Corp was created in Panama in 2015 on behalf of a client of his whom he did not identify. Also, Chad Petrovich claimed that AK Drilling International operates pursuing the legislation and regulations from jurisdictions where they are established. The other aforementioned individuals preferred to remain silent. BBVA stated that it does not issue letters of recommendation but does, at the request of a client, provides “letters of presentation that have a pre-established format and that include absolutely objective data.” It also stated that these documents make no value judgment about the client and the client uses them for “strictly personal” purposes only. The bank did not respond to the questions about the cases that this investigation details, claiming to be prevented by law from doing so. For its part, BCP had not responded to our questionnaire by press time.